Finding new excuses for Angelenos to explore L.A. neighborhoods on foot is fast becoming one of our blog’s favorite hobbies. That said, coming up in November, got another one for you: The 9th Annual Inglewood Open Studios. 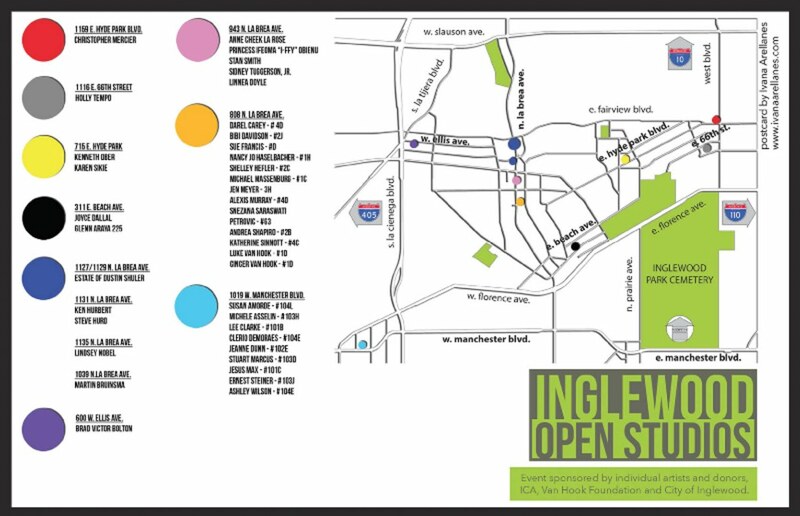 Founded in 2006 by a pair of local artists (Renee Fox and Kenneth Ober), Inglewood Open Studios has evolved into a yearly art affair encompassing the second weekend of November. The 2015 walk will be held on the weekend of November 14-15 with open exhibiting hours from 12:00pm – 5:00pm on both Saturday and Sunday. Over three-dozen artists will be exhibiting work on this year’s tour, which runs through a string of galleries along La Brea Blvd, and branches off west towards La Tijera, east along Hyde Park, and as far south as Manchester Blvd. It’s a free self-guided tour, meaning all you need is a map and a decent pair of walking shoes and you can tackle it at your own pace. Check the map below for route details. To find out more information, get updates about this year’s walk, or city portfolio images of the artists participating in the art tour, visit inglewoodopenstudios2015.com.